On this website, I am showcasing my collection of communication equipment used by German, English, Canadian, American and Japanese forces around World War 2. I have been collecting these equipment for almost thirty years now. Most of the equipment shown on this website are in fully operational conditions as they were back in 1940-1945. I repair/restaurate these equipment myself using only authentic components and blueprints which I have collected. And, as a licensed radio amateur, callsign PA0PZD, I am also trying to make contacts with other radio amateurs with these restored equipment. It is amazing, that these old fashioned, more then 65 years old, radio’s still doing very well, comparing them with the modern radio’s of today. Of course, frequency bands are more crowdy today with all kind of signals, then at that time, also the technical standard at that time was less then today. Just take in mind, that I am still very busy in uploading new pictures and replacing them by new ones. Also the text is changing sometimes. So keep visiting my website to see for new items. Enjoy it. A beautiful part of my collecting is for instance, the RAF aircraft equipment ,the equipment used by the wireless operator and navigator in the Lancaster bomber, but also interesting is the H2S radar equipment, used in the WW2 British bombers. My special interest is the radio equipment in the various radio nets, used by the British Airbornes at the Battle of Arnhem, september 1944. Arnhem was the Market part of operation Market Garden, while the south part of the river Rine was the Garden part. I spend a complete article about the functioning of these wireless sets and reasons of the often failed radio nets between the Divisional Command and Brigades, and Brigades and battalions, during that battle. 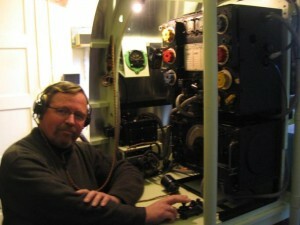 This discribed especially in the post, Battle of Arnhem Edition, a article also for special radio equipment and in the various posts of the wireless sets, to be seen in the categorie “British Wirelesss Sets and receivers“, also the Light Warning Sets Units, The VEEP installation, and the Eureka Rebecca installation, used also at Arnhem. Now I am starting with completing the several posts with history about function and developement of the installations, with text and new pictures. Especially the German posts are in progress now. I appreciate your comment on it. My home made Lancaster mock up. Here I’m sitting in front of the T 1154/R1155 combination in the wireless operator office of my Lancaster mock up. I have a CW contact with a Dutch radio amateur in the 80 meter band , mostly on 3575 Kc and sometimes also in phone at 3705 Kc. However, because of of lack of room, I have to move to another place, a separate apartment in the garden of my home, I had to remove the whole mock up. There was no place for it anymore. But the pictures are a nice remembrance to it. The equipment is replaced in the new apartment in the back of my garden. Much more room is available now. If you have any questions or comments you can ask me on the contact from. The overview of my collection in the new apartment is a 360° picture in the picture below.You can rotate it around by clicking on the arrow buttons on the top left.